D. socialis is widespread in much of Britain, but scattered in the west and a number of other areas. It is widespread in north-western and central Europe. D. socialis almost always occurs well camouflaged on the bark of tree trunks, less often in the litter at the base of trees and sometimes on fences in woods. However, the species has been recorded from a number of other habitats including damp rock faces in a disused quarry (Mackie 1965). The females construct a web of very fine threads, covering an area of about 6 x 4 cm2, which lies very close to the trunk surface, practically invisible to the naked eye, and on this web they are approached by males during courtship (Kullmann 1961). Investigations in Germany showed that the species selected regions of trunks covered with a layer of epiphytic algae, probably because of increased prey availability in such areas, and placed webs under protuberances on the trunk, presumably to gain protection against water (Schütt 1997). Mackie (1965) showed that in north Cheshire, 45% of individuals were uniformly black, and suggested industrial melanism. Adults occur in late summer and autumn with a peak of activity in September and October. Mature females have been seen on trunks until late in December (Gurr 1967) and there is some evidence that a few adults over-winter. 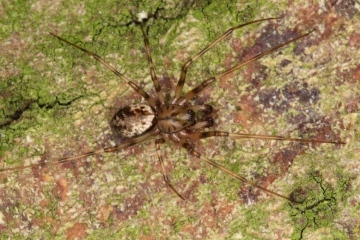 Immatures have been noted in tiny sheet webs in detritus at the base of trees but may be seen on the trunks from April to July. Fairly common, and may be locally abundant. Female Drapetisca with springtail prey. D. socialis male in web.